We realize that losing one or more of your natural teeth can be traumatic. But at the Dental Implant Center of Syracuse, you’ll be in good hands. Our practice has been providing dental implants to Syracuse, Auburn and Central New York area patients for more than twenty years. 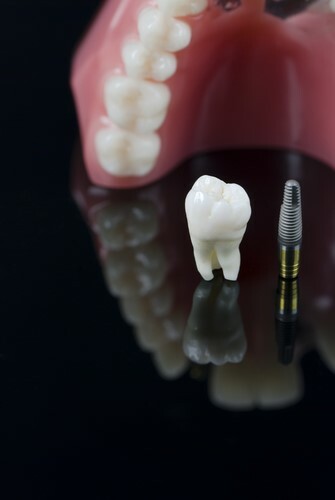 Of all the restorative dental options out there, dental implants provide the best alternative for patients missing all, some, or even only one of their teeth. If you have missing teeth, then you can benefit from the implant dentistry of Dr. Martin. Dental implants are artificial roots that are placed into the jawbone so that replacement teeth can be mounted to them. These implants are strong and stable, and will look and feel like natural teeth. Dental implants are a long-term and permanent solution to missing teeth, and can help restore your smile and confidence. The dental implant is meant to last patients for life, with no need for frequent dental appointments, adjustments or stabilization. The implant will stay securely in place comfortably and naturally. Dental implants help provide the security of knowing you no longer need to fear that your denture will dislodge when you eat, laugh or sneeze. Dental implants in Syracuse can be an excellent alternative for single tooth replacement. We are now able to replace a missing tooth without involving adjacent natural teeth. In some situations implants can eliminate the need for removable partial dentures. Candidates for dental implants should have healthy gums and a sufficient amount of available bone to support the implant. It is also important that the patient is committed to maintaining oral health and taking care of the implants properly. Since candidacy can vary, your case will be evaluated during your consultation to determine if you are a candidate for dental implants in Syracuse. If dental implants are not the best option for you, our dentists will help you determine an appropriate solution. Other dental implant alternatives include our dental bridge treatment. Will my Dental Implant Require Surgery? Implant placement is considered to be a gentle surgical procedure that can be performed in our office with the use of local anesthesia. It is conducted in the same manner as other dental procedures. While there is a light discomfort following the surgery, very few patients complain of major pain afterward. If you wish, we can also provide you with intravenous sedation to help ease your surgical anxiety. Like all surgical procedures, there can be some discomfort. However, anesthesia and sedatives can be used to help reduce the discomfort of oral surgery. Our dental implant experts will prescribe medications to ease any soreness or discomfort that may occur during your recovery period. Depending on the specific dental needs of the patient, the number of dental implants being placed, and the health of the patient, the recovery time for dental implants can vary. After dental implant surgery in Syracuse, patients may experience some discomfort and swelling that should subside over the next couple of days. To ensure a successful recovery, it is important to follow the post-surgery instructions provided to you by the dentist performing your procedure. Will I Need to Stay Overnight after Dental Implant Surgery? There is no need for patients to stay over the night at our dental facility in Syracuse. Dental implant surgery is performed as an outpatient procedure. No overnight stay is required. However, there may be some down time after the surgery is finished. If you have questions or are interested in scheduling an appointment for dental implants in Syracuse or Auburn, please contact the Dental Implant Center of Syracuse in New York. If you prefer to call, ask for Peggy. She will be happy to speak with you.